Originally planned to last only a week, the campaign has proved to be extremely popular. 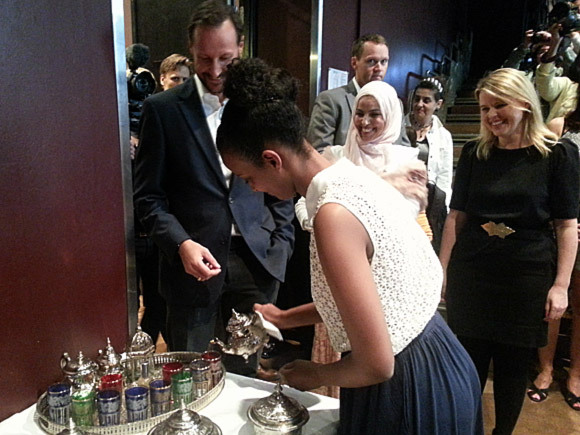 Tea Time was organised by the Norwegian Centre against Racism, and encouraged Norwegian Muslims to invite their Norwegian neighbours into their homes for a cup of tea to become better acquainted. The chance to talk together, exchange experiences and listen to one another provides a means of breaking down prejudice. The tea parties also provided the opportunity to ask questions about religion. Some guests asked why the Muslims do not use the Bible, while others wished to know more about the role of women in Islam. Gudny Ingebjørg Hagen told the audience about her Tea Time visit. Kari H. Partapuoli, Director of the Norwegian Centre against Racism, gave a presentation on racism and immigration, while Victoria Marie Evensen and Hanne Martinsen of Dinamo gave an evaluation of the campaign.